Yes, I’m getting this June entry in before midnight signals the first of July! 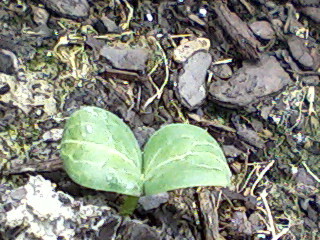 : ) This is a picture from June 25 — of the watermelon plant that’s growing. It’s not the original; I had to replant the seeds. The cantaloupe came up, and so did the squash and the cilantro and all the others. And I just knew those watermelon seeds I initially planted would surface. So I waited. And waited some more. I have patience and perseverance. But you have to use your instincts too. Something told me it wasn’t going to happen. But I figured that maybe there was a chance the seeds went a little too deep and had to work their way up. I waited on the chives also, but they never appeared, not even after a second planting. You get to a point where you just have to understand that nothing’s going to happen without another planting. I couldn’t replant the chives because I ran out of seeds — and those seeds may not have been any good… But that second planting of the watermelon made me happy. It was so good to see that plant break through and start its garden journey. Our lives are like that too. Dreams we thought were dried up take on new life with a little replanting and tender care. Not all dreams are meant to be shelved at a certain time. Some are like really good books that you take off that old shelf and get lost in. Do you have any unsurfaced dreams waiting to break through? Get busy and give them new life. Make this summer a time for birthing babies!